CT Gastroenterology Associates - Lisa M. Rossi, M.D. Residency Internal Medicine -University of Connecticut School of Medicine. Residency Chief Medical Resident - University of Connecticut School of Medicine. Dr. Rossi served as an intern and resident in internal medicine at the University of Connecticut School of Medicine where she served as chief medical resident. 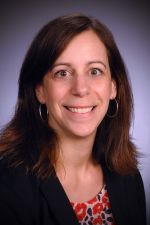 Following her residency, Dr. Rossi served as a gastroenterology fellow at the University of Connecticut School of Medicine where she held an appointment as chief gastroenterology fellow. Dr. Rossi has received several honors and awards, she was named intern of the year from 2000-2001 and in 2003 she earned the Veterans Administration Ambulatory Award for primary care from the VA Connecticut Healthcare System in Newington, Conn.
Dr. Rossi treats a broad range of GI diseases including colon cancer screening, esophageal disorders, inflammatory bowel disease and a special focus on women’s issues in gastroenterology. She is involved in the teaching and education of future gastroenterologists and serves as the University of Connecticut GI Fellowship Site Director at Saint Francis Hospital.